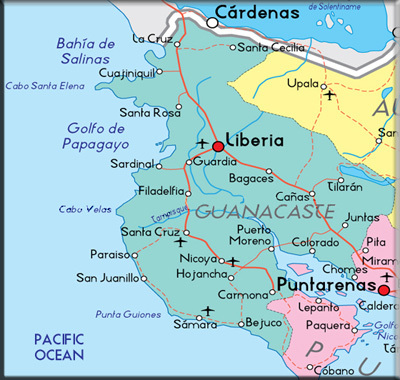 Liberia is the capital of the province of Guanacaste ( Costa Rica ). Liberia is about four hours from the capital of Costa Rica. Is often called “The White City” because in the past its streets were made of “gravel”, a whitish powdery materials. The climate of the canton is usually hot and dry from November to May. But it becomes wet from late May to early November. During September and October heavy rains. It has an average annual temperature of 27 º C.
Nicoya canton is the second in the province of Guanacaste , Costa Rica , founded on December 7 of 1848 , making it one of the first thirteen cantons that had the country. It has a land area of 1333.68 km ² and is divided into seven districts. Its capital is the city of Nicoya, located 350 kilometers by road from the capital San Jose. Today Nicoya is a busy commercial and services center: it has one of two provincial hospitals (Hospital of annexation), and is a transportation hub that connects various resorts of the south coast of Guanacaste, as Samara and Nosara. The canton of Nicoya is subdivided into 7 distritos (districts). Santa Cruz is a canton of Costa Rica in the province of Guanacaste, located northwest of the country. Its capital is the city of Santa Cruz. The territory now called Canton of Santa Cruz, was originally called “The Place of the Diriá” by the by the first Spanish conquistadors. The canton of Santa Cruz was officially established by Law No. 36, Article number 9, the December 7, 1848 and is the third in the province of Guanacaste. The canton of Santa Cruz is subdivided into 9 distritos (districts). In pre-Columbian times the territory which is now the canton Bagaces, was inhibited by an indigenous group called Nahuatl or Aztec. 15 km north of Bagaces is the Miravalles volcano with an elevation of 2028 m and a crater about 600 m in diameter. On 7 December, 1848 Bagaces was first mentioned as a canton in a decree. Carrillo is the fifth canton in the province of Guanacaste , Costa Rica , known as “The National Archaeological Canton”. Was established on 16 June 1877 by Presidential Decree No. 22, during the interim president Dr. Vicente Herrera Zeledon . The economy is based mainly in agribusiness and in recent years tourism has become an important factor in the economy of its inhabitants.